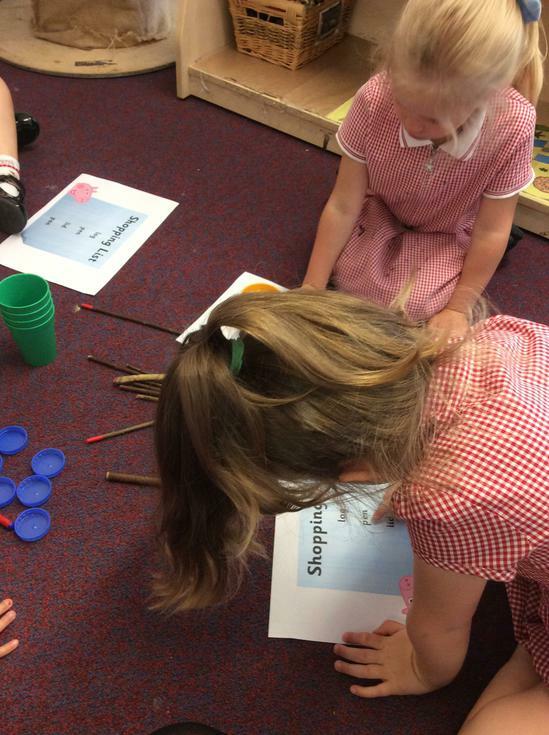 Our class teacher is called Miss Neill and we have two teaching assistants, Mrs Garfield and Mrs Wheeldon. 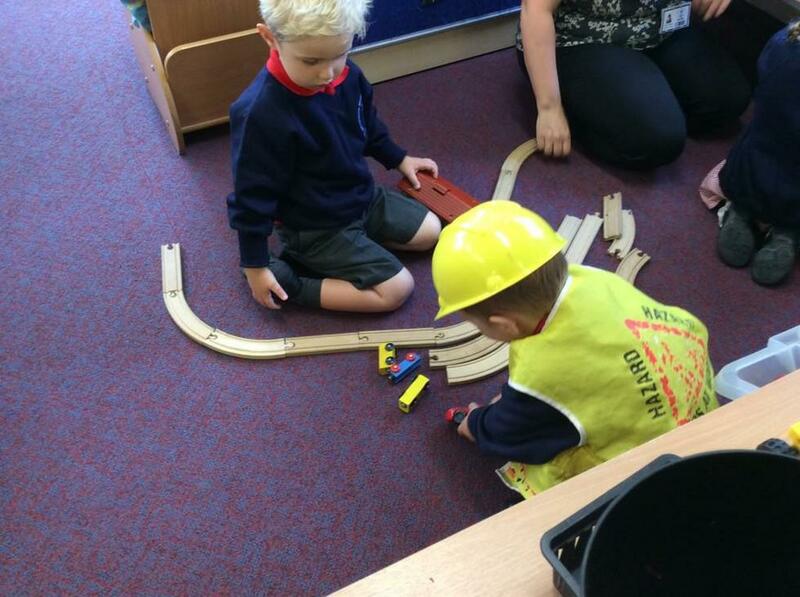 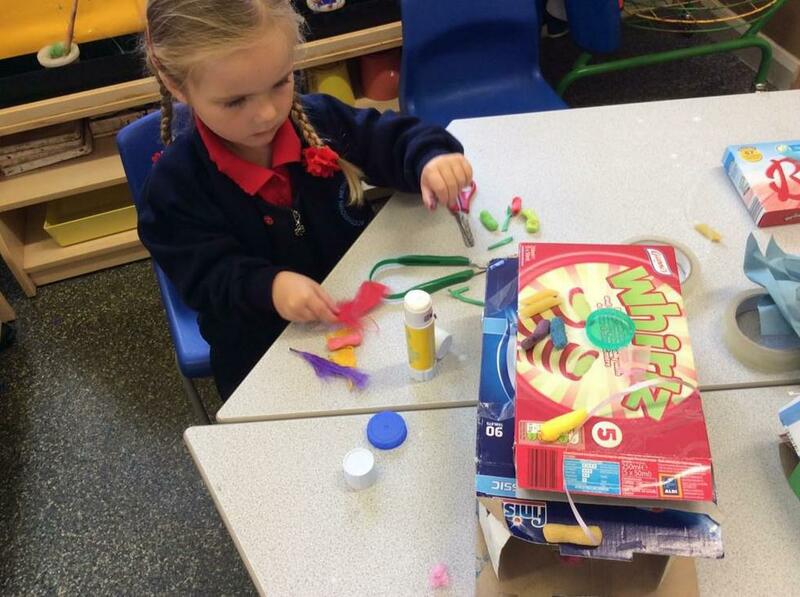 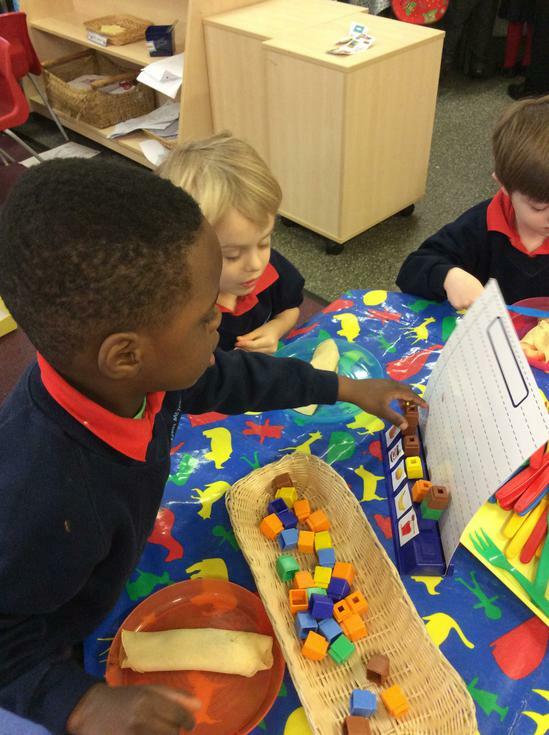 There are 25 children in our Nursery. 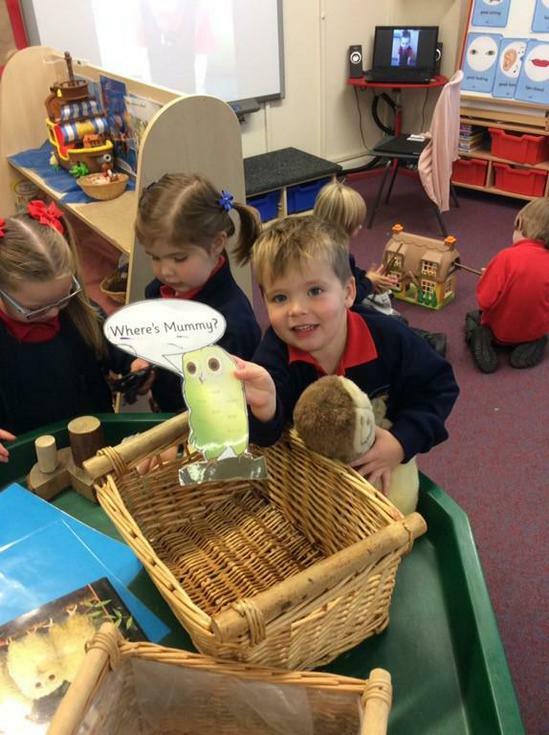 Nursery had a Teddy Bear Picnic as part of their Bears topic. 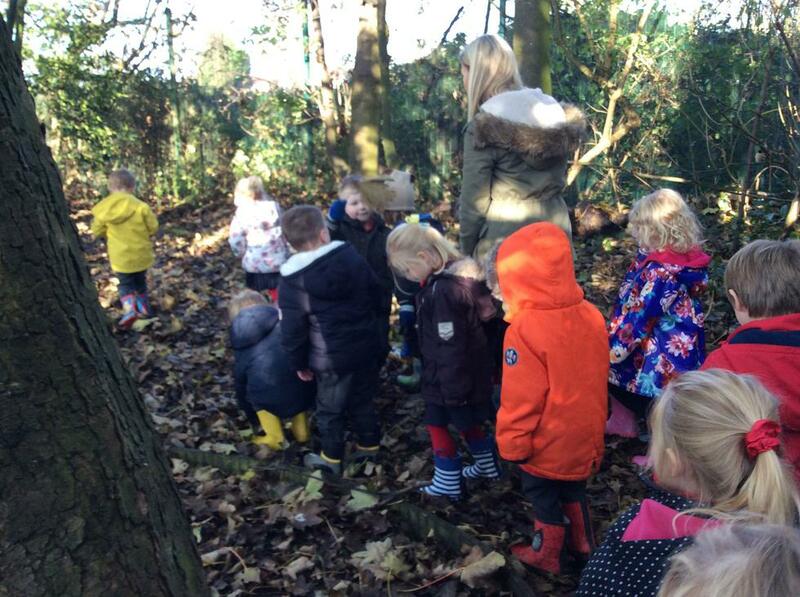 Nursery enjoyed their sensory bear hunt today. 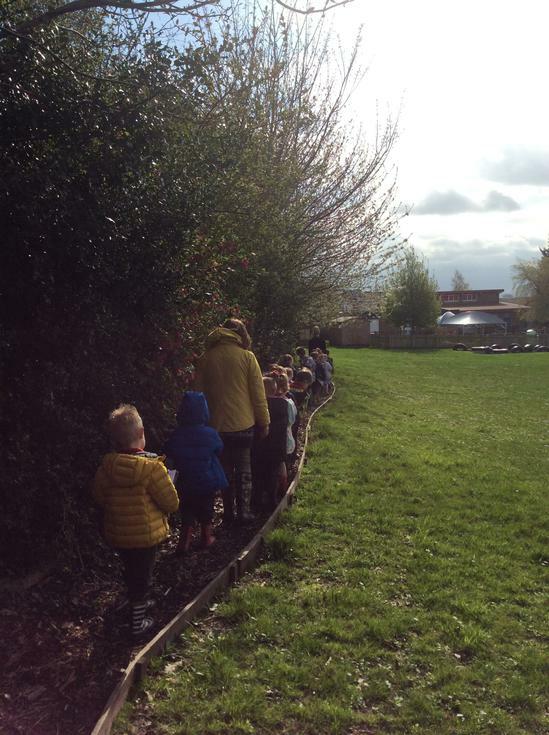 They walked through all the different stages from the story We're Going On A Bear Hunt. 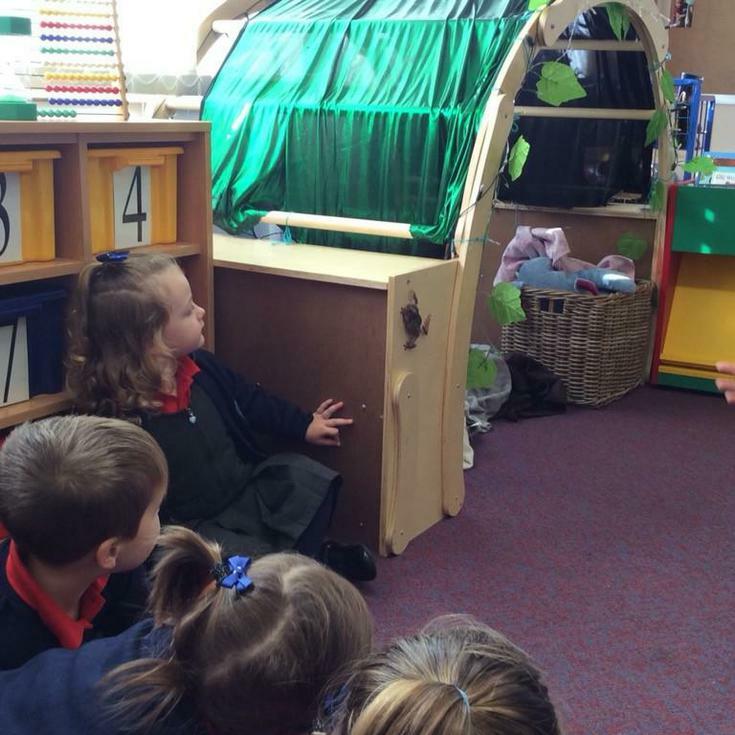 Nursery had a special visit from Peppa Pig this week during a phonics session. 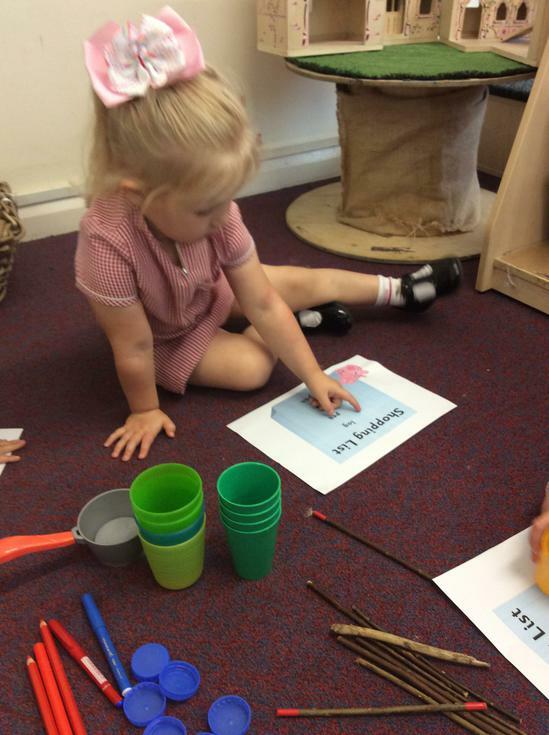 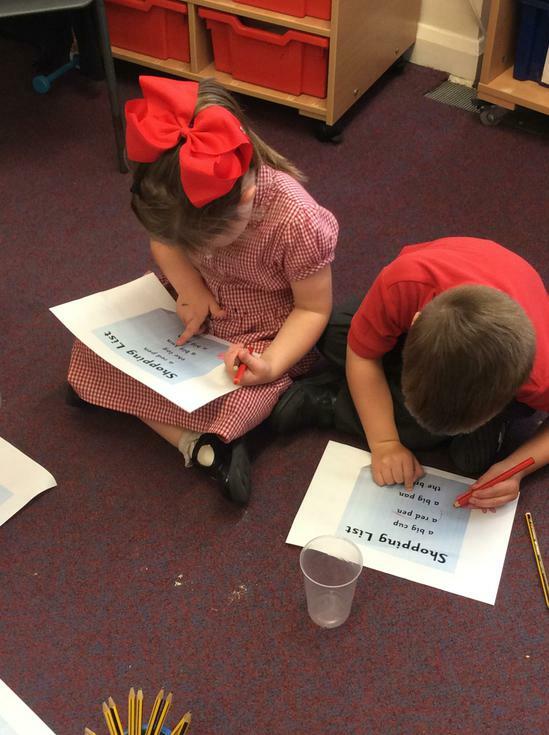 They then had to read her shopping lists and find the correct items. 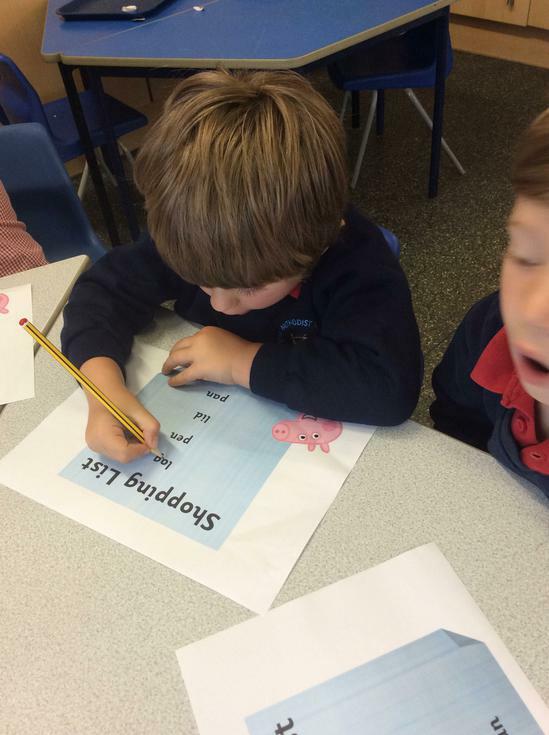 They did a great job and even got a thank you letter from Peppa Pig! 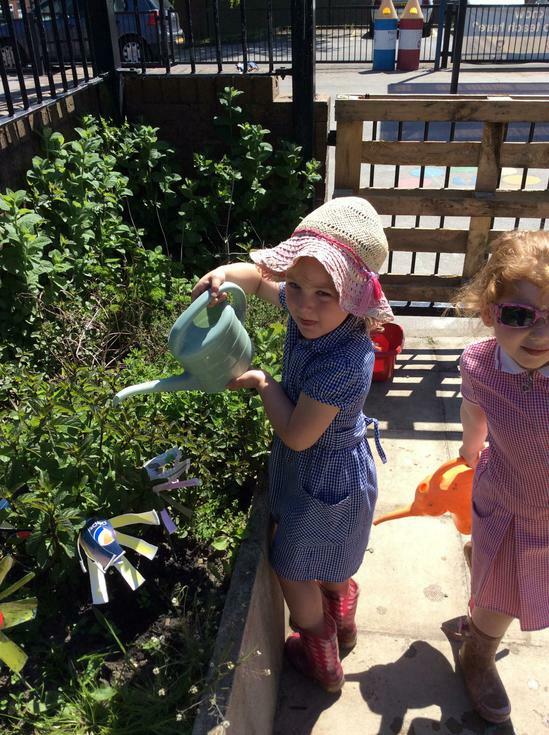 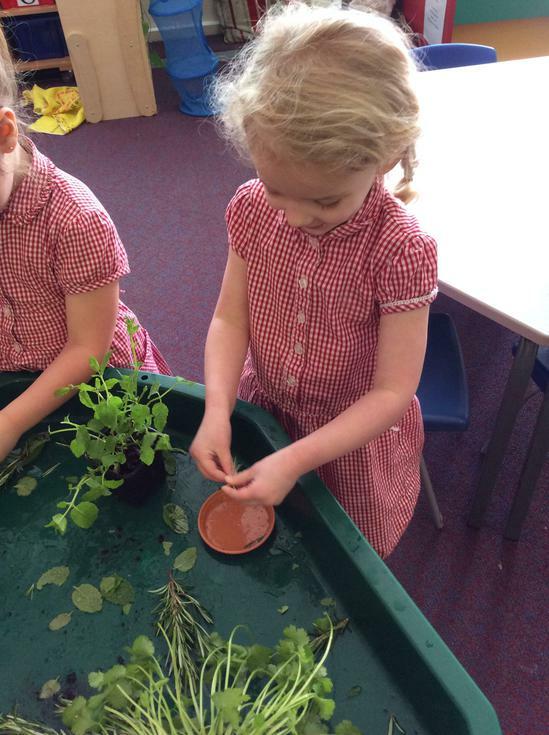 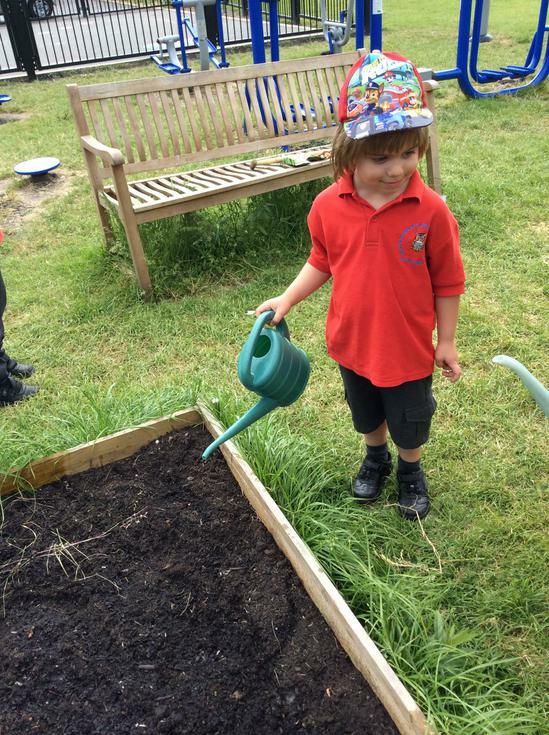 Nursery have been learning about Plants and Growing. 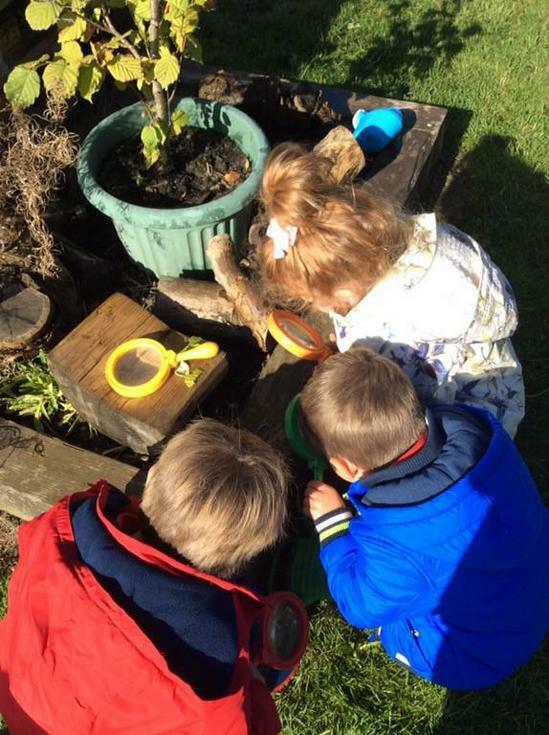 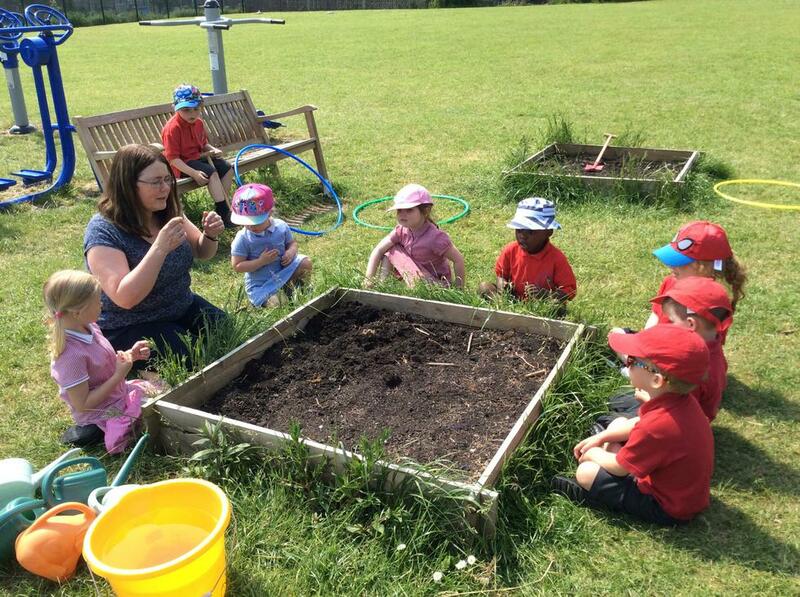 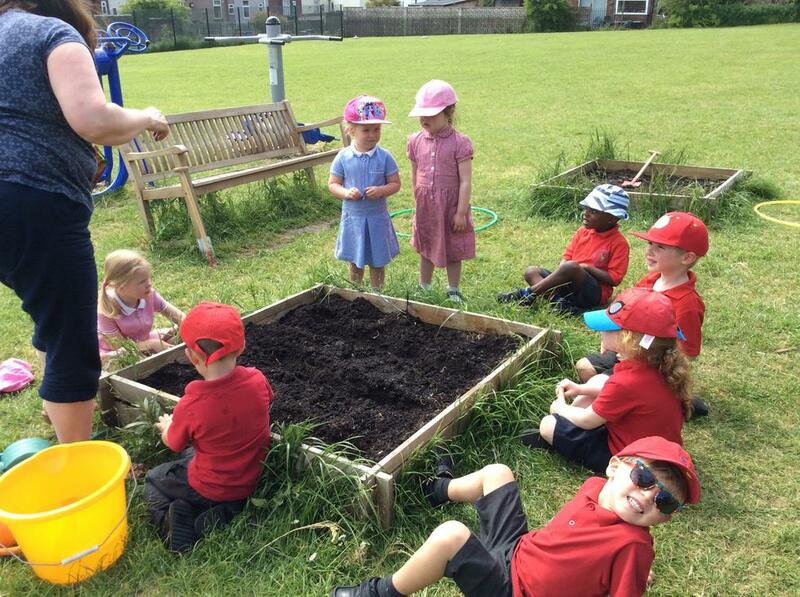 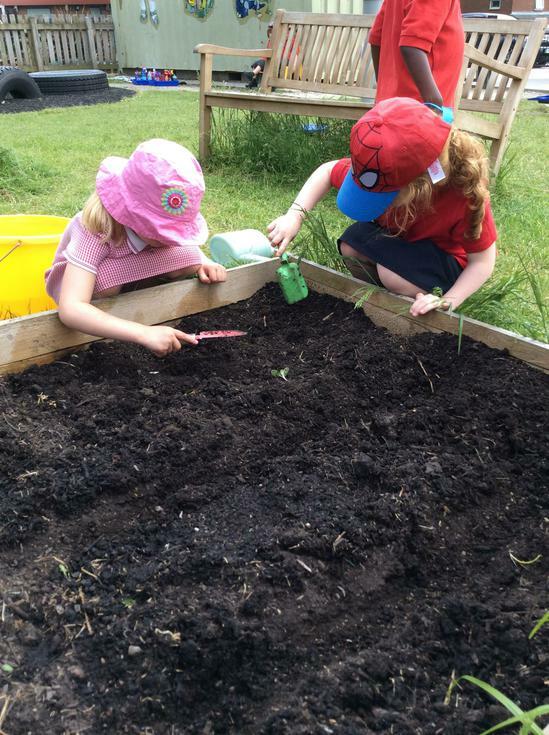 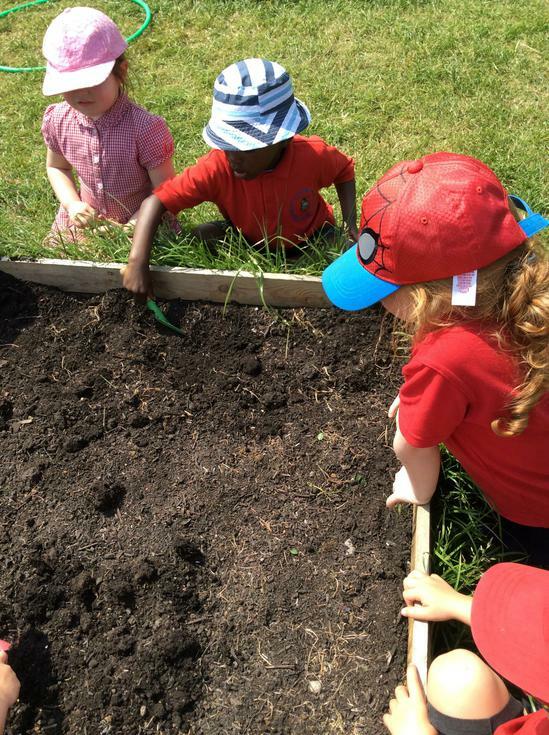 They have planted carrots and beans in the planters on the field, explored herbs and various scented plants, mixed paint to create their own petal colours and learnt about the life cycle of a plant and what they need to grow. 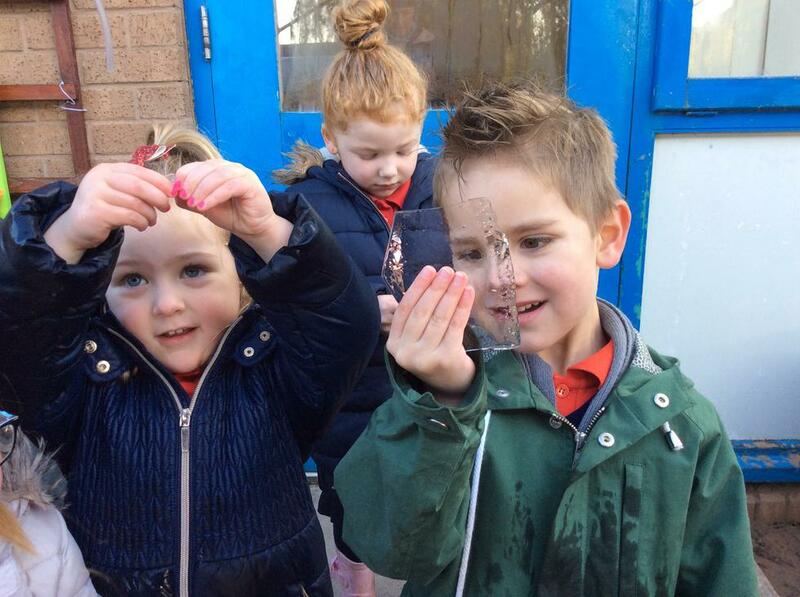 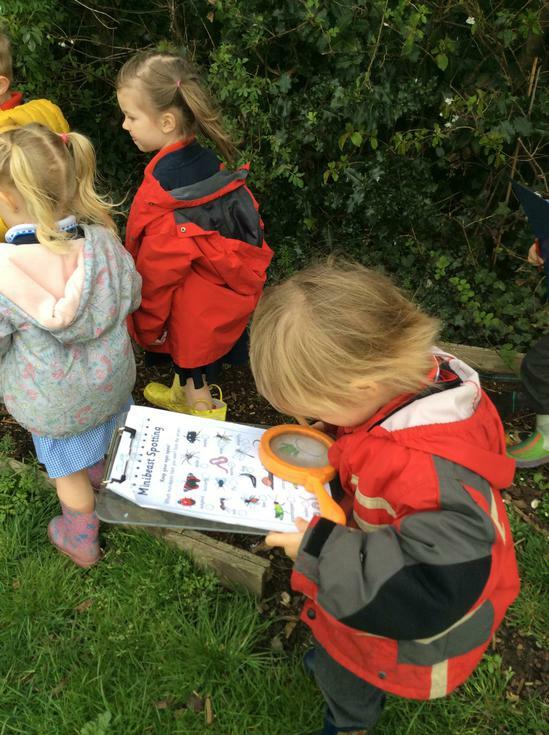 Nursery's new topic is Minibeasts. 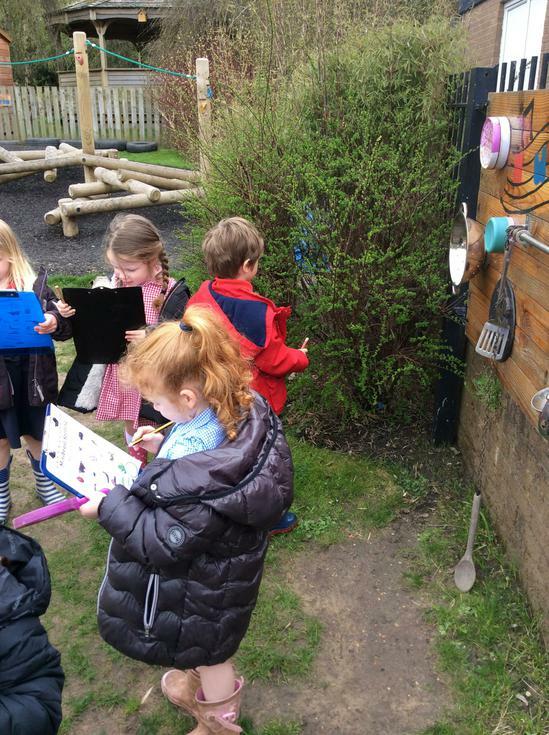 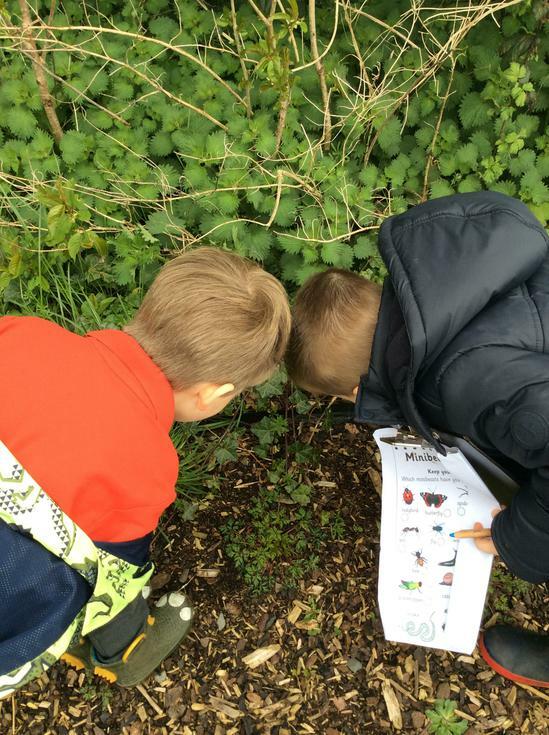 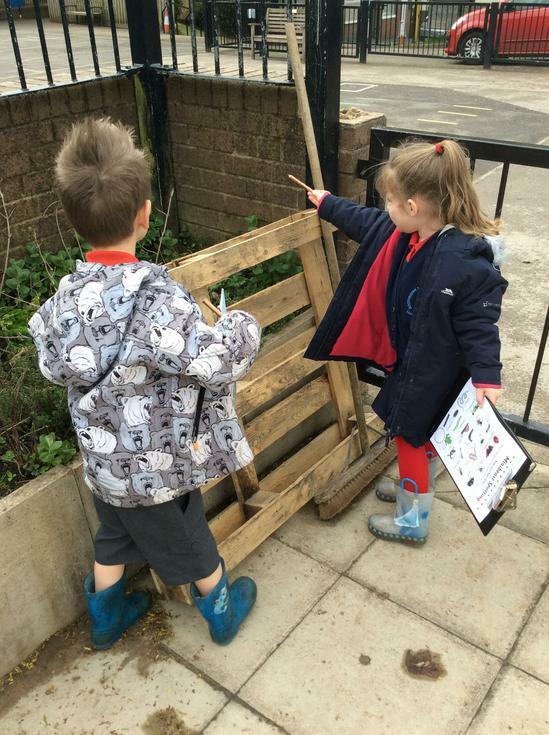 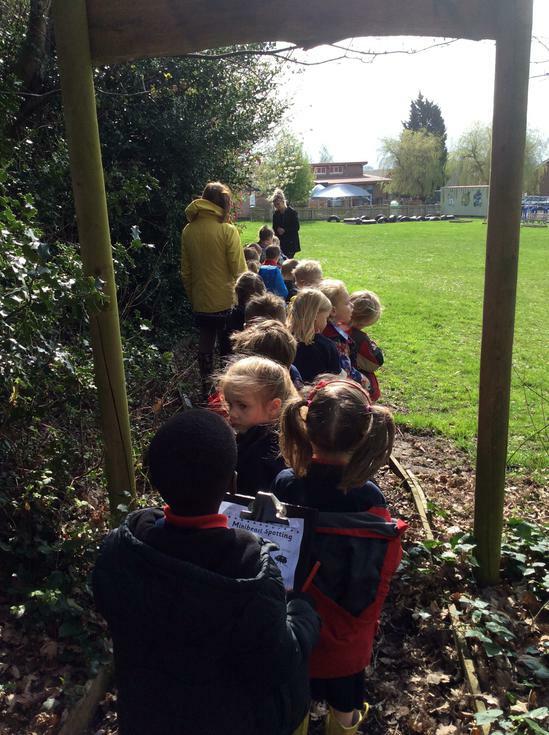 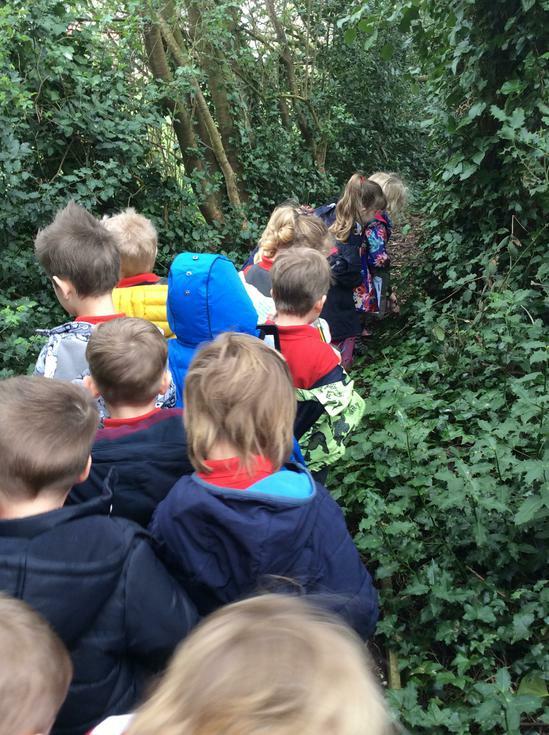 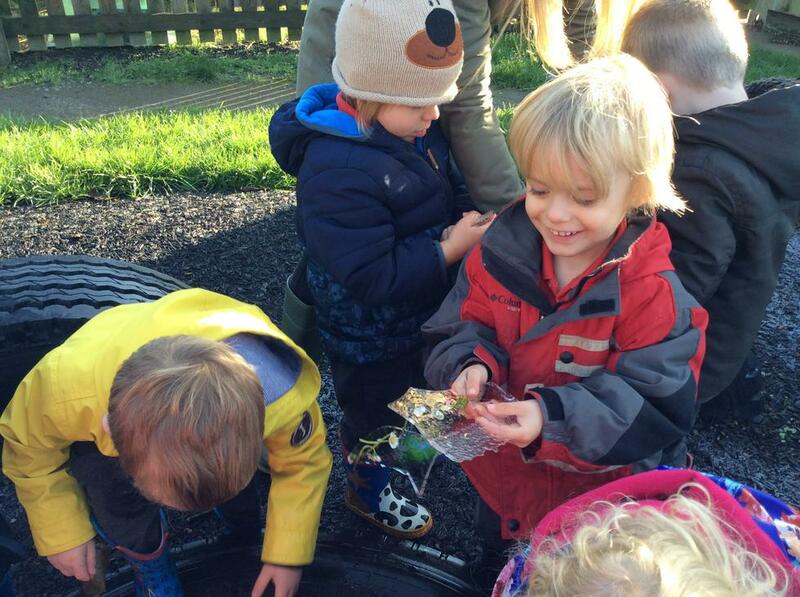 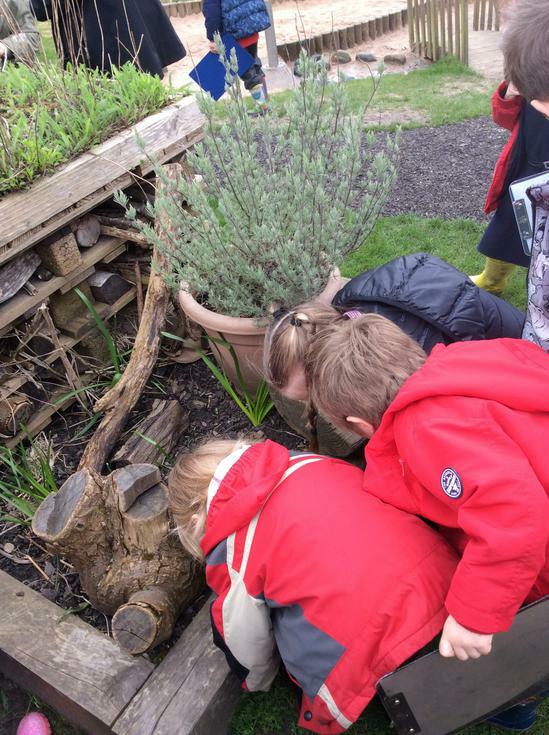 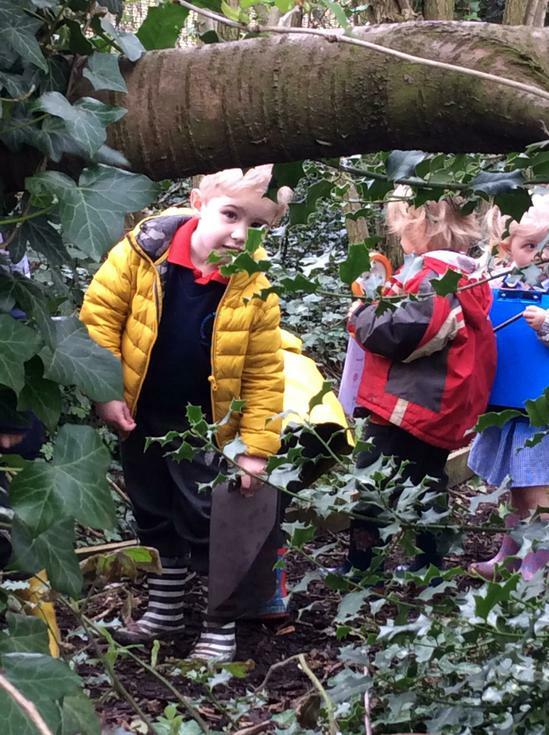 We went on a minibeast hunt in our garden area and along our woodland trail. 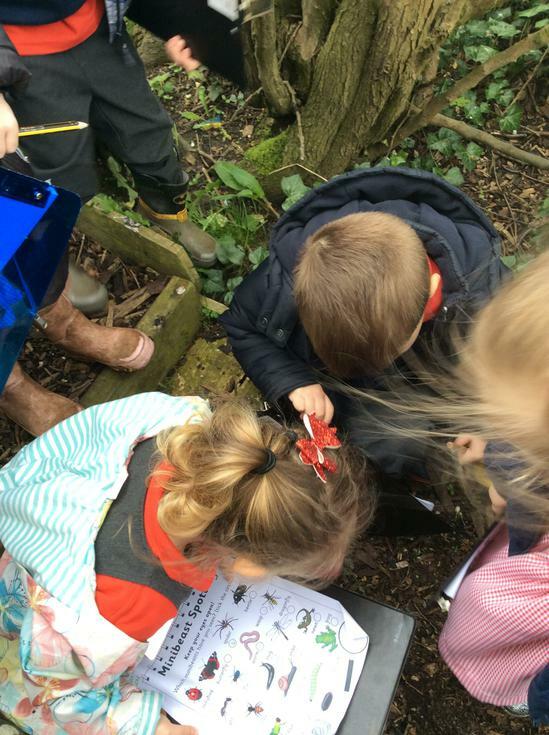 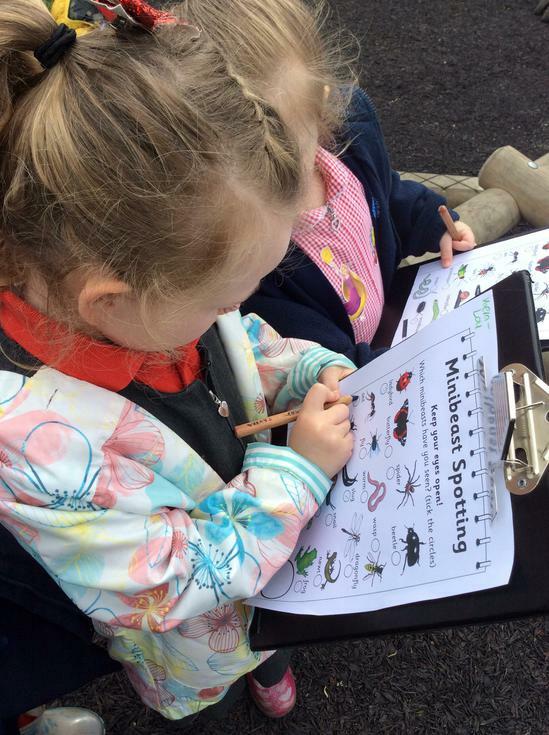 We found lots of insects to cross off on our checklists, including bees, woodlice, ants, slugs and worms. 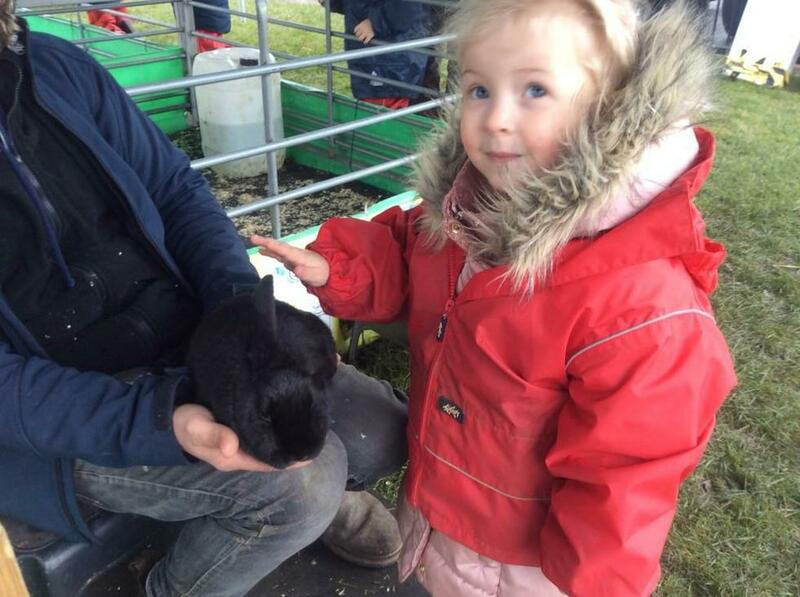 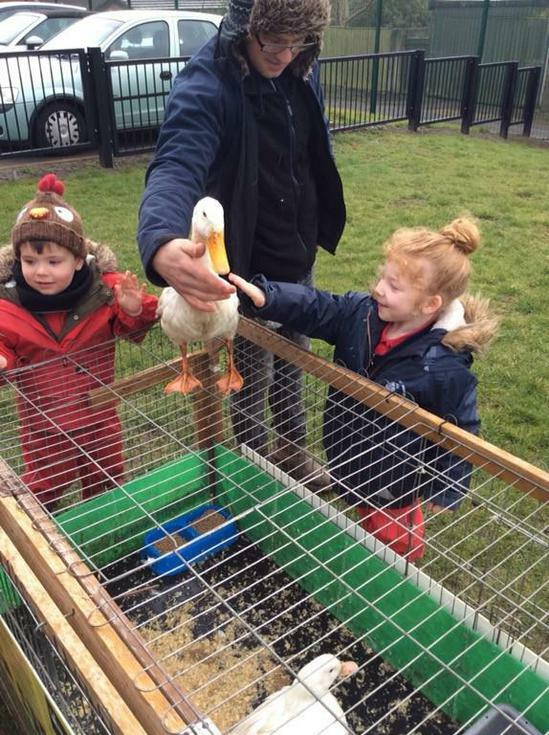 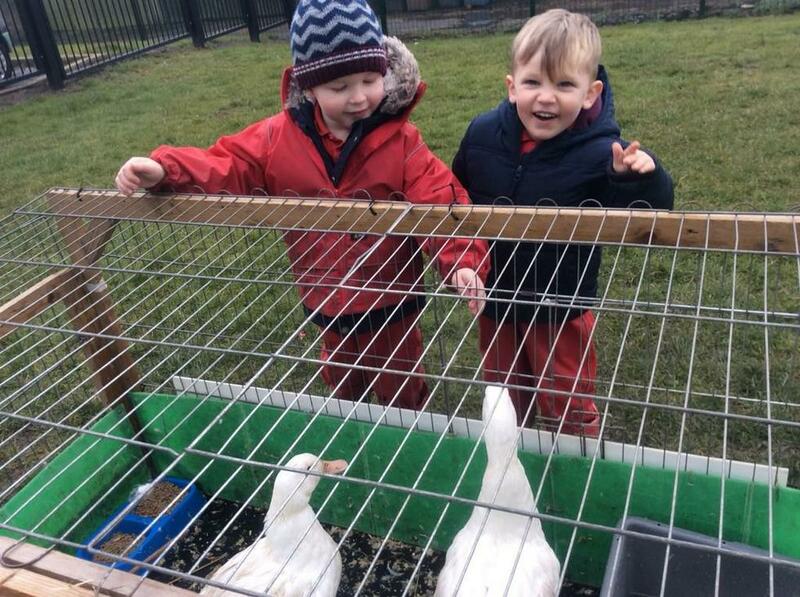 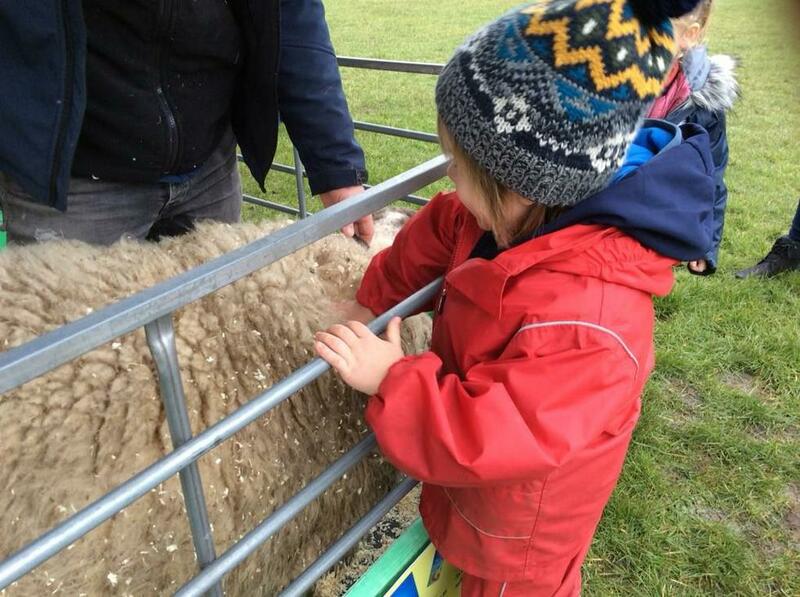 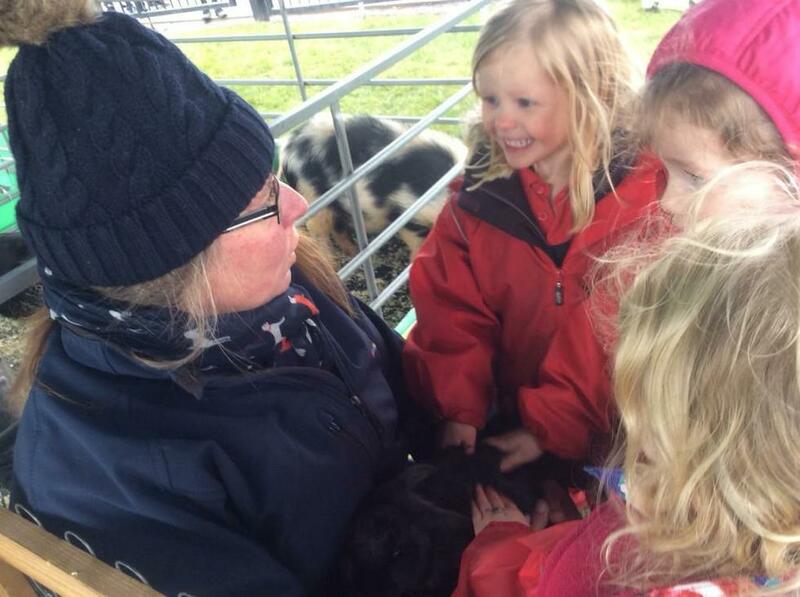 Nursery have been learning about The Farm. 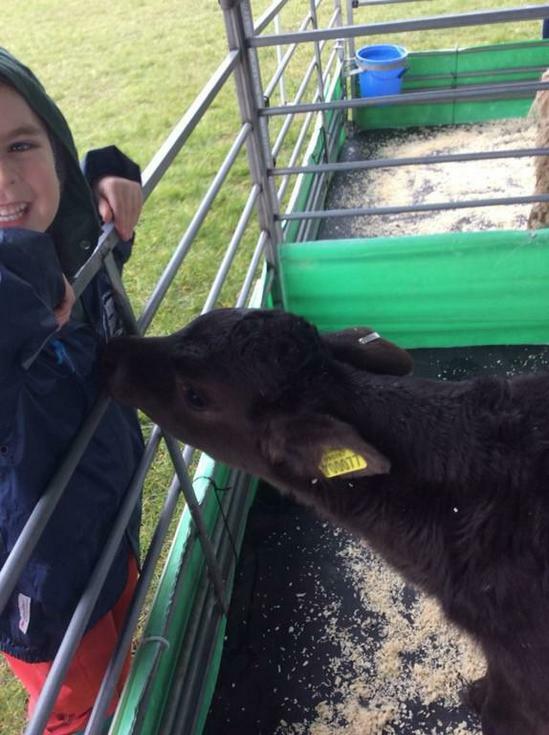 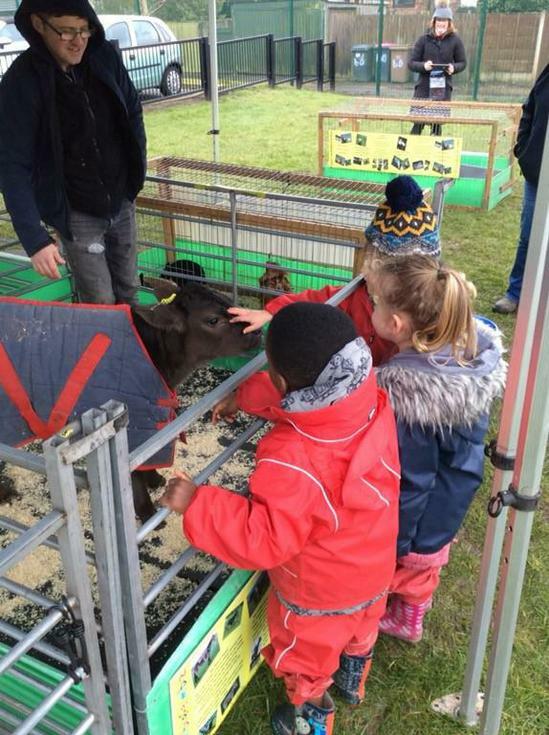 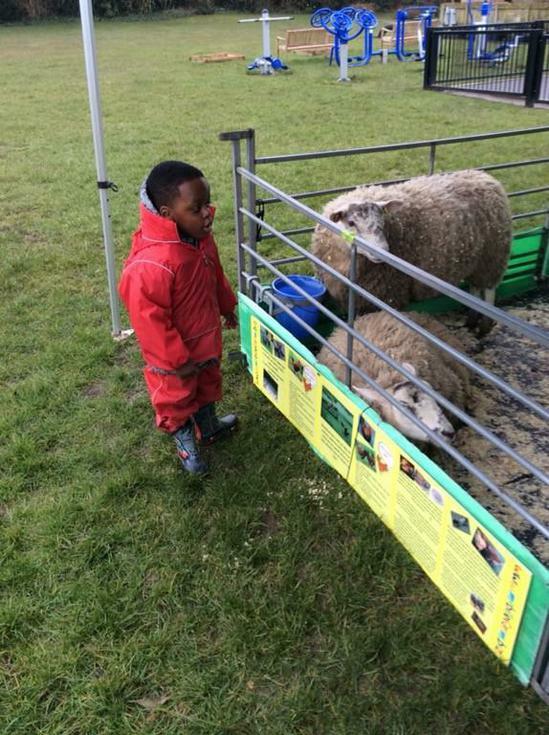 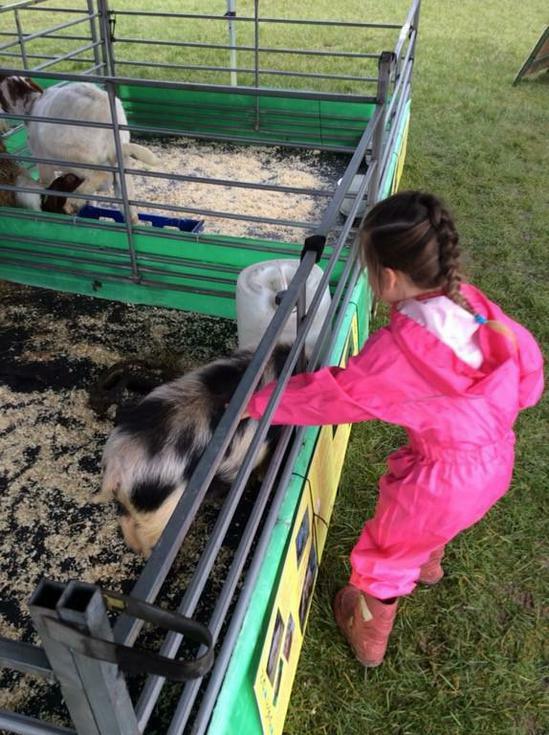 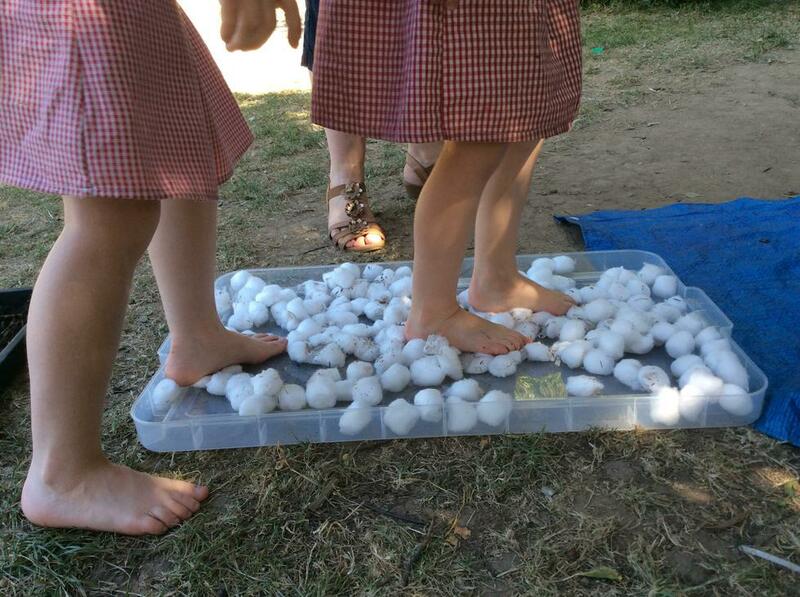 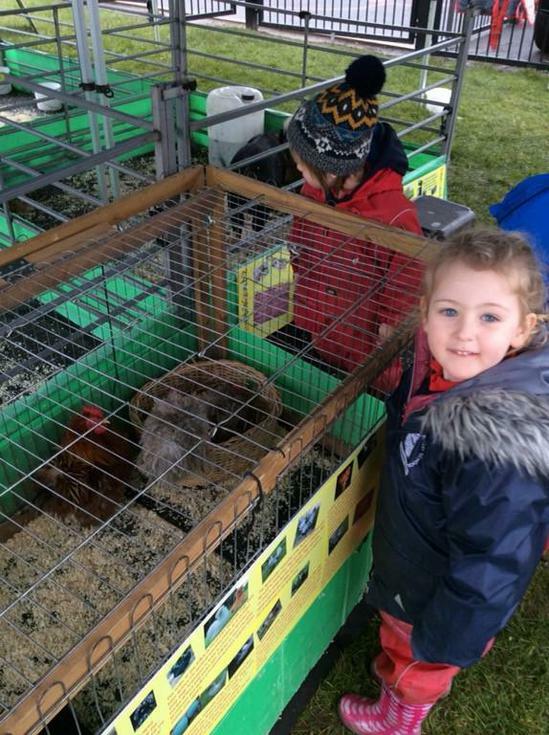 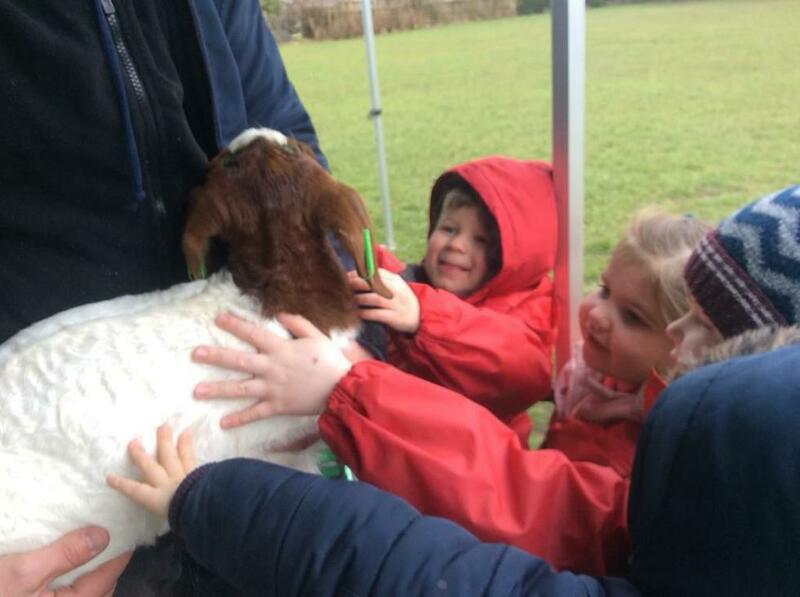 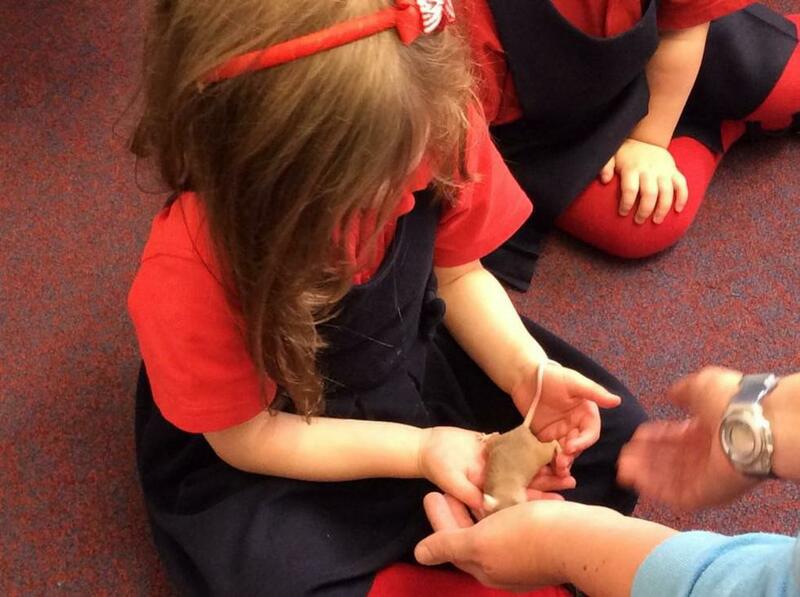 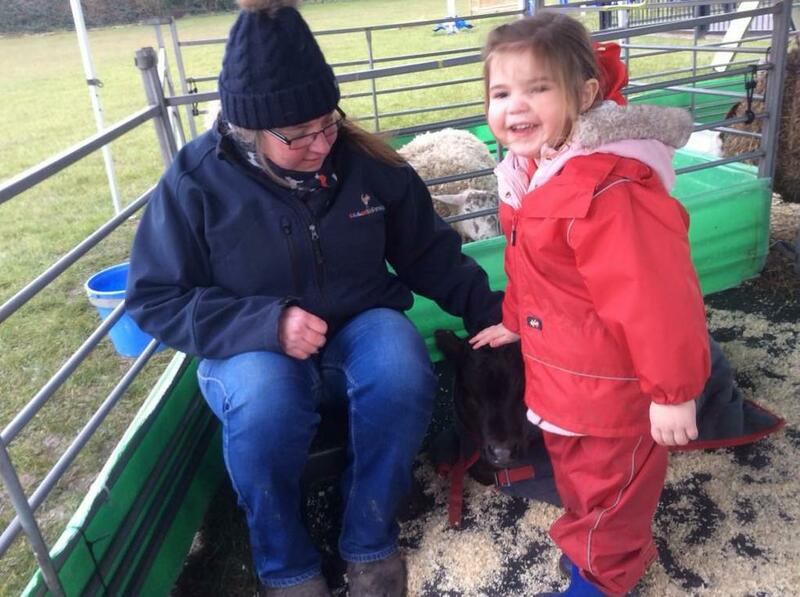 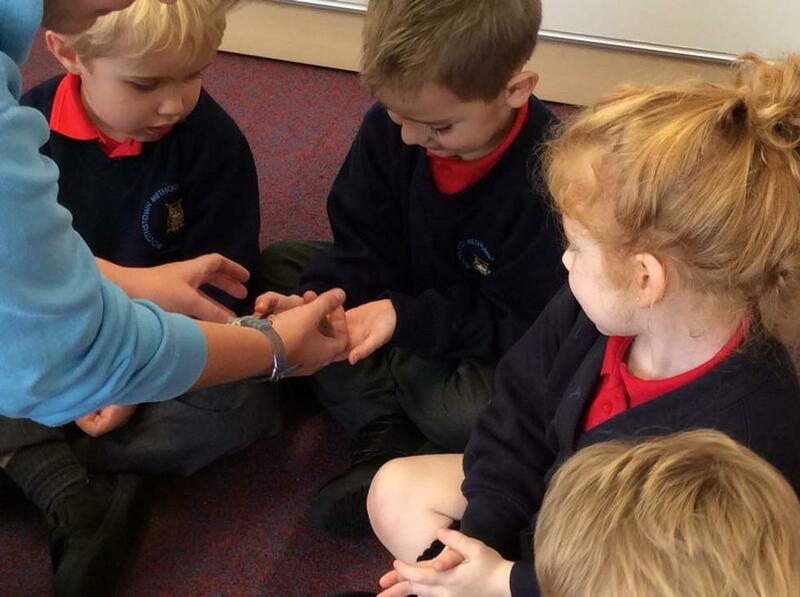 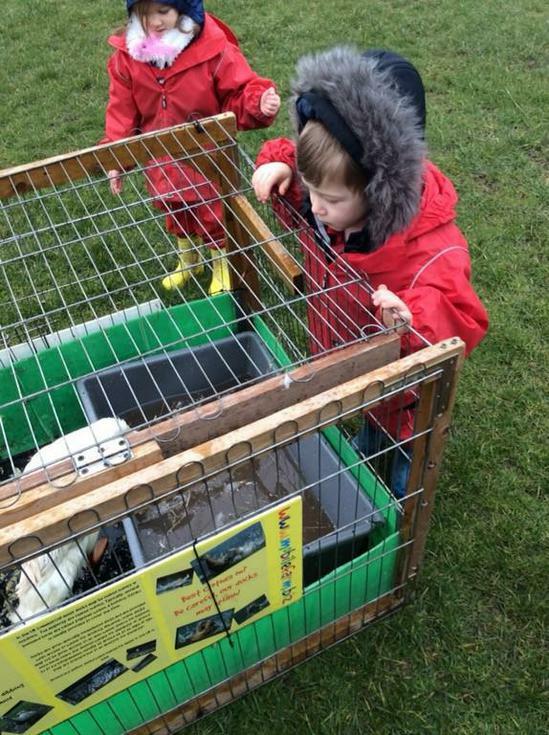 On Tuesday a mobile farm visited our school and we got to stroke, hold and learn about the different farm animals. 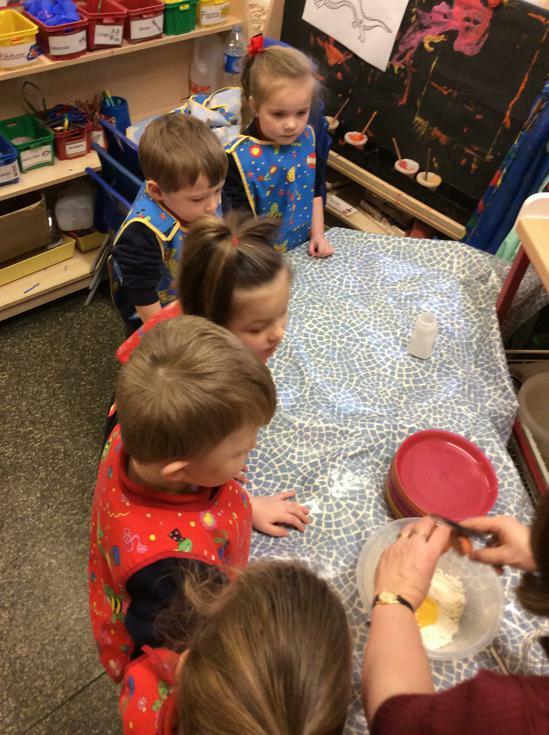 Nursery had lots of fun making pancakes on Pancake Day. 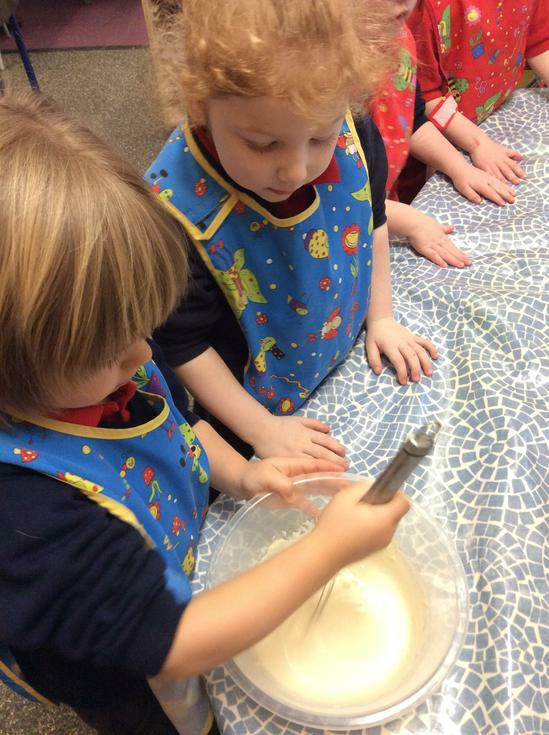 In groups, we made the batter and then cooked the pancake on the hob. 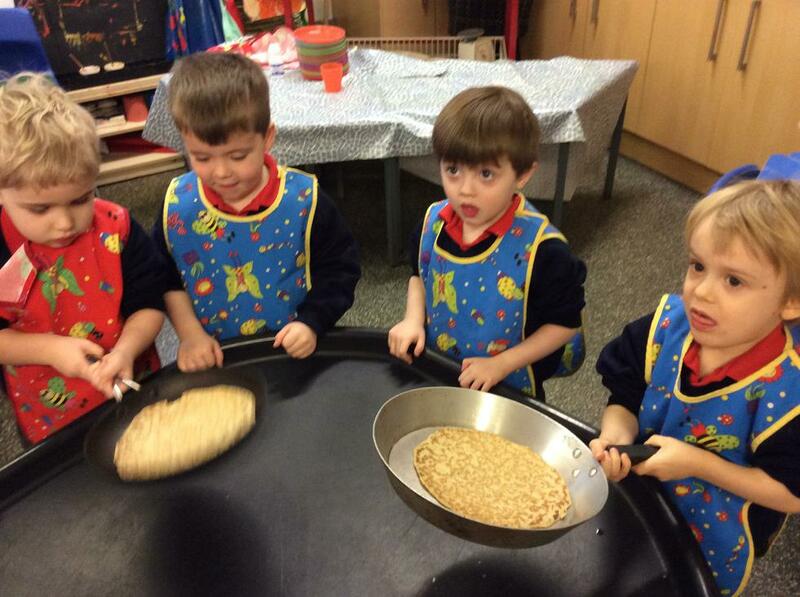 While they were cooking we flipped big pancakes in the frying pans. 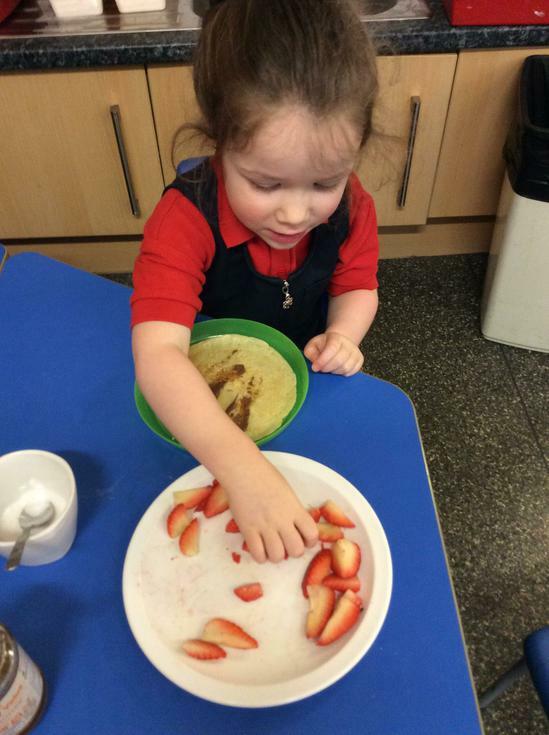 When they were cooked we chose what toppings we would like and then put our bricks on the chart to find out what was the most popular topping. 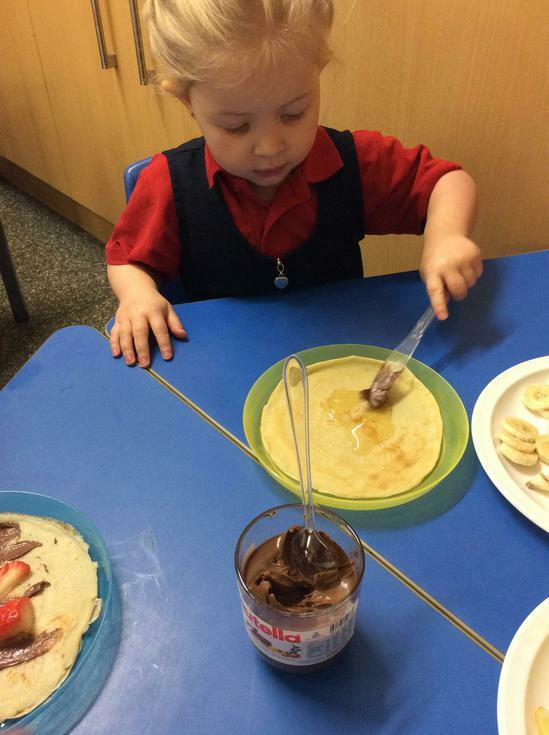 We then used a knife and fork to eat our yummy pancakes! 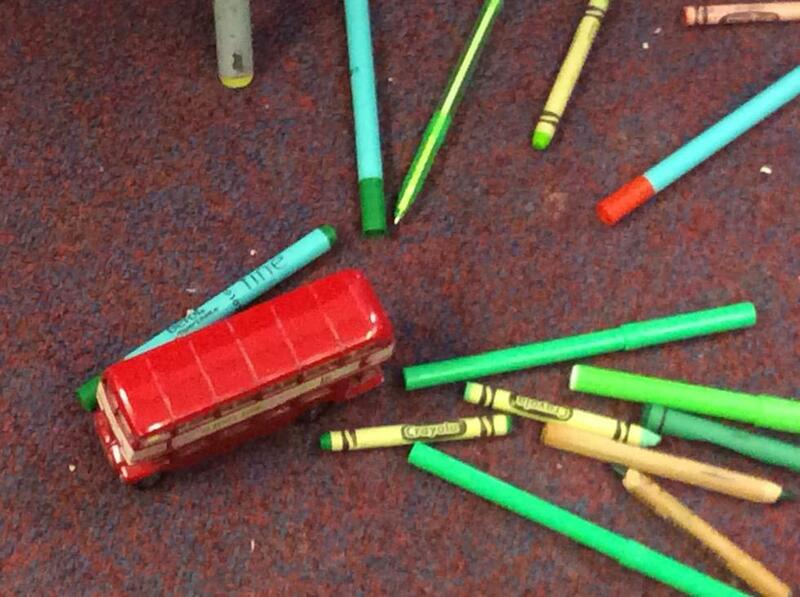 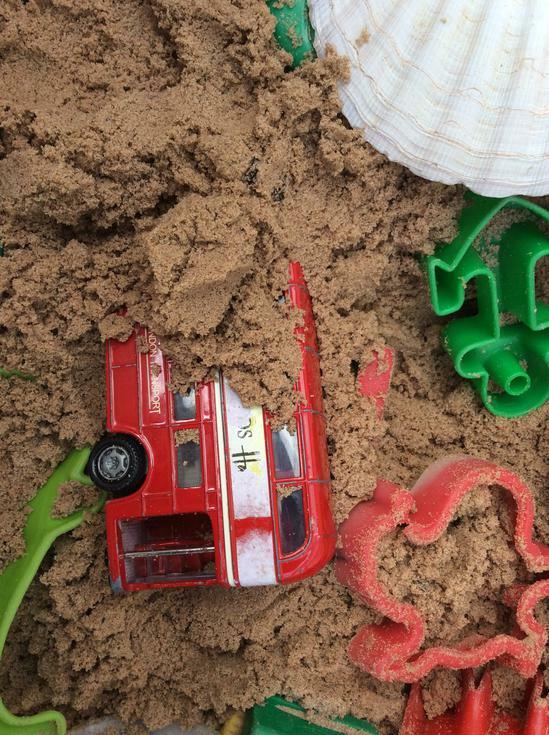 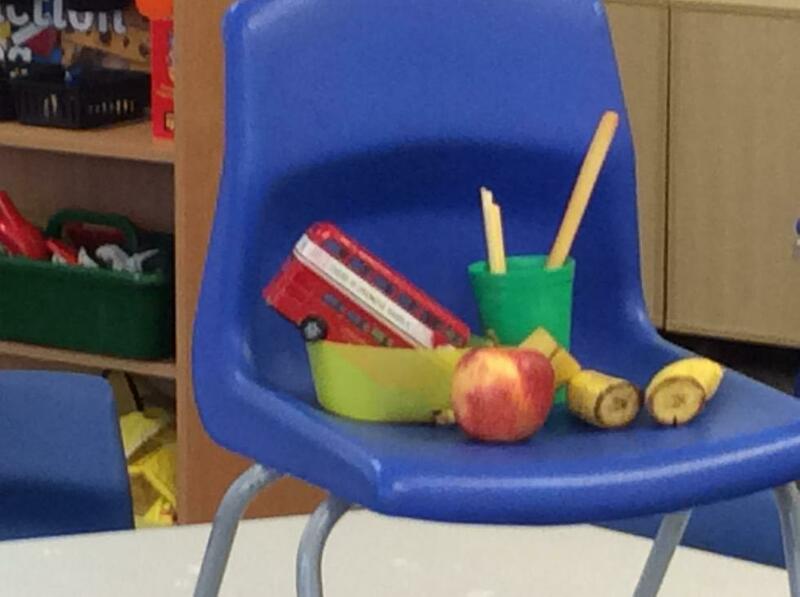 Nursery had a Naughty visitor in their classroom this week, it was The Naughty Bus! 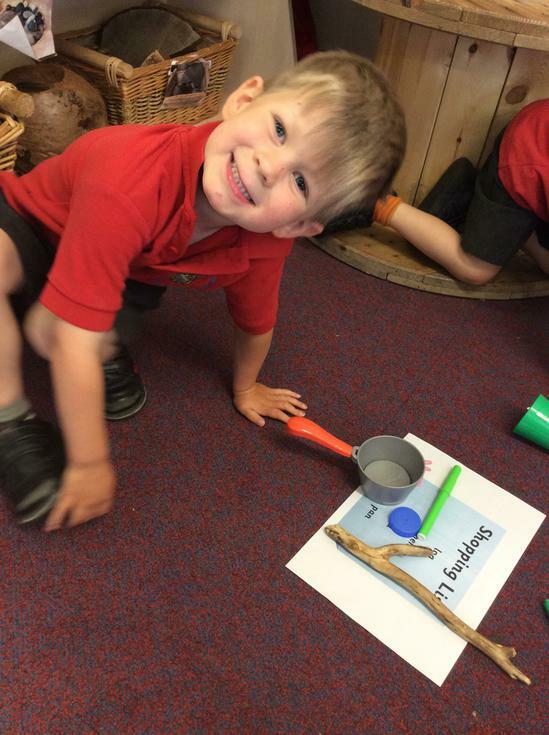 We thought of different things that he could do in the classroom and then created the scenes together. 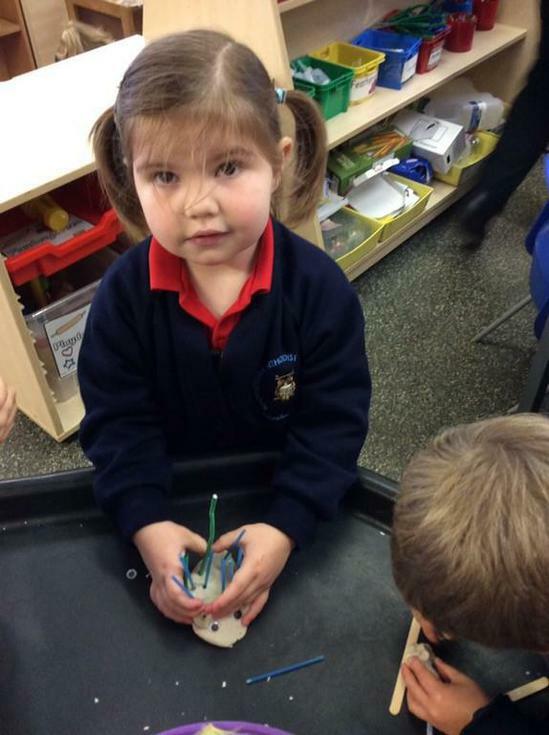 We then made them into a book and when it was complete we took it into Reception and read them our story 'Nursery's Naughty Bus'. 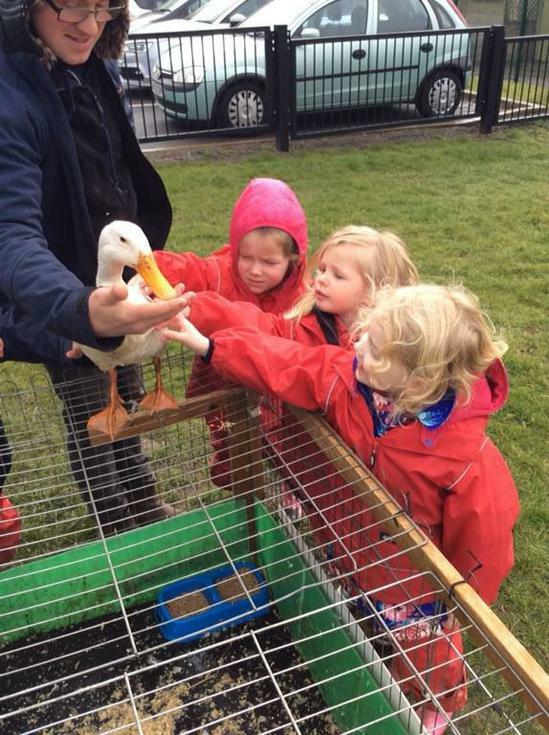 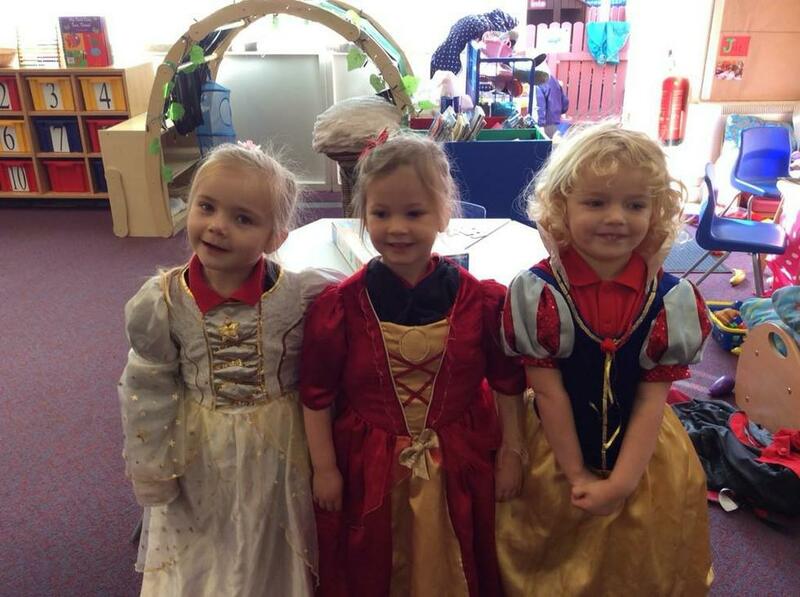 Nursery had some special visitors today! 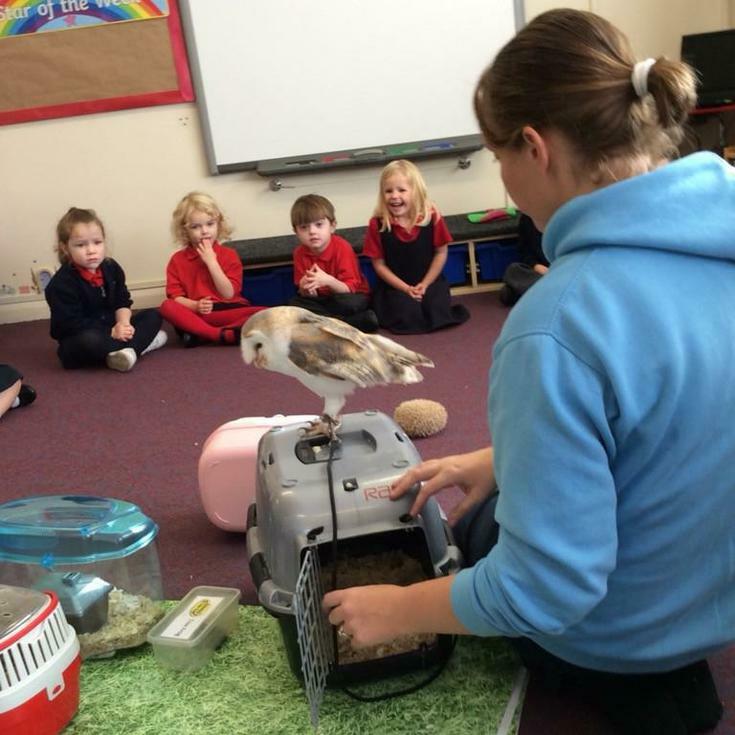 To support our Nocturnal Animals topic we met Jesse the Barn Owl, Snuffles the African Pygmy Hedgehog, Fredo the Tree Frog, Twinkle the Gerbil and Bits the Fancy Rat. 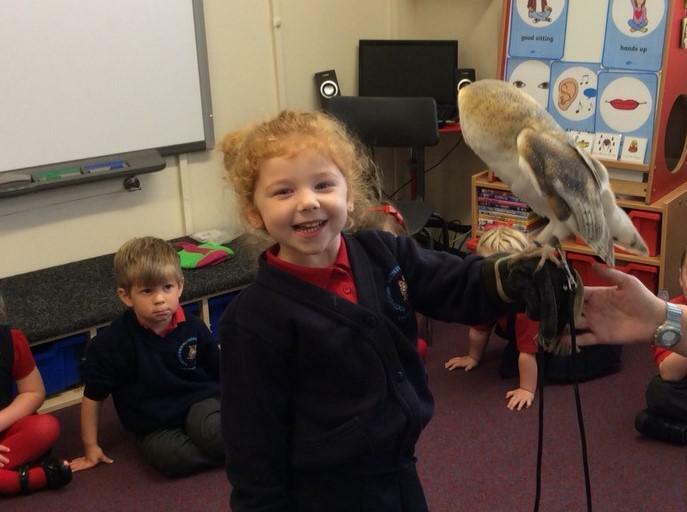 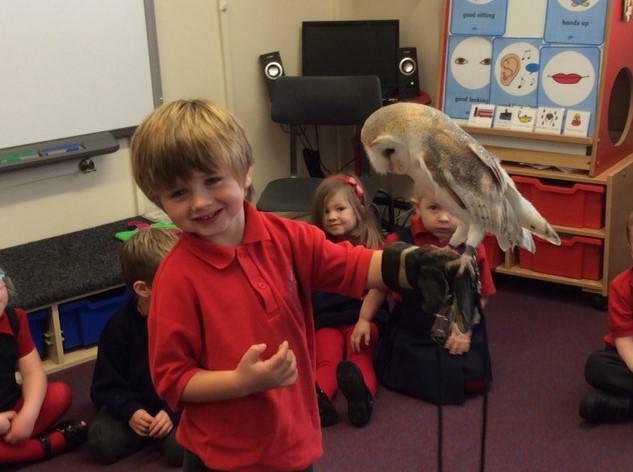 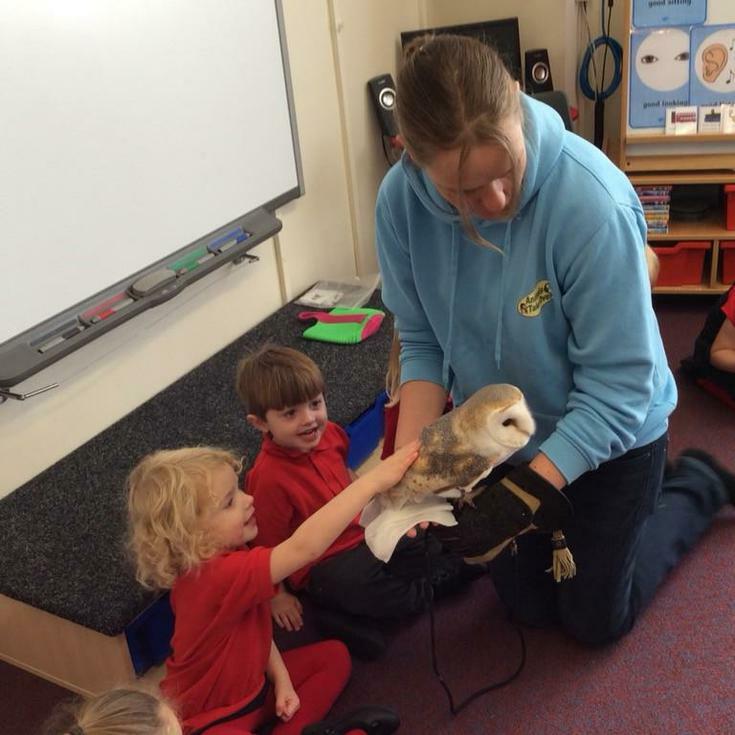 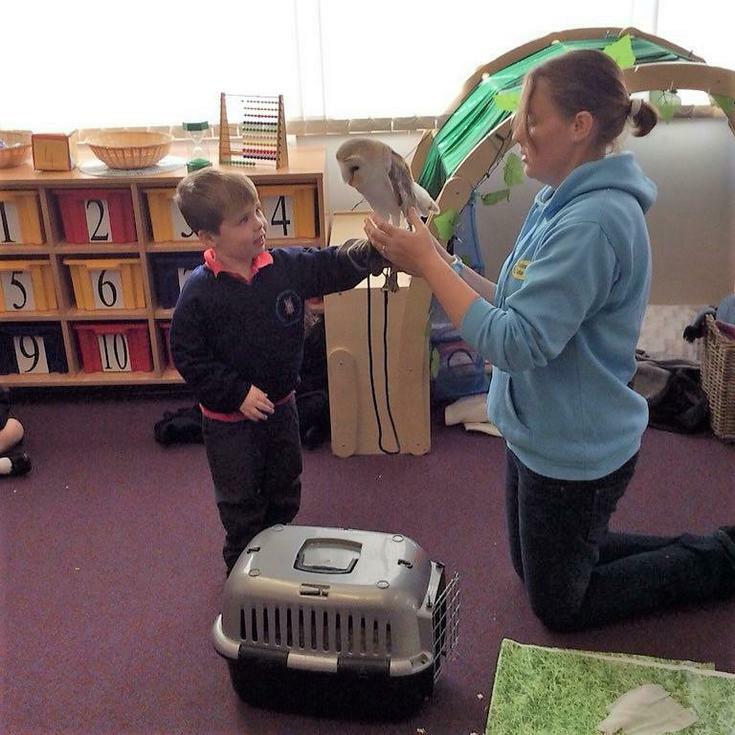 We all got a chance to hold them and even did some special tricks with the owl! 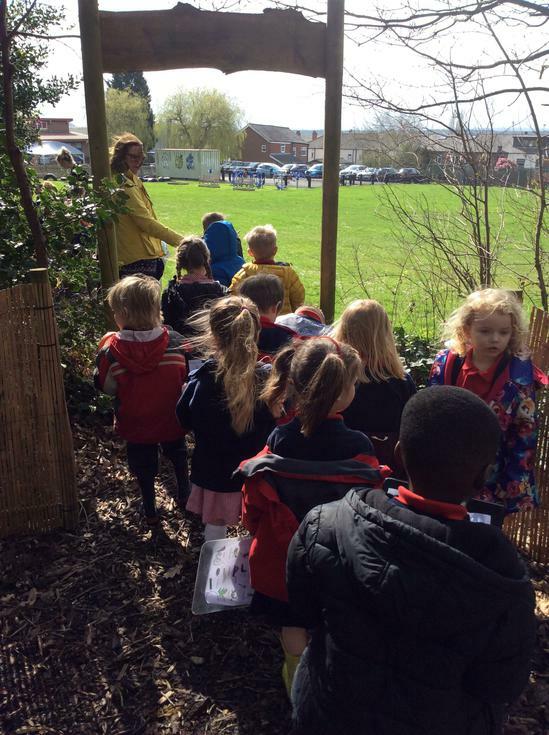 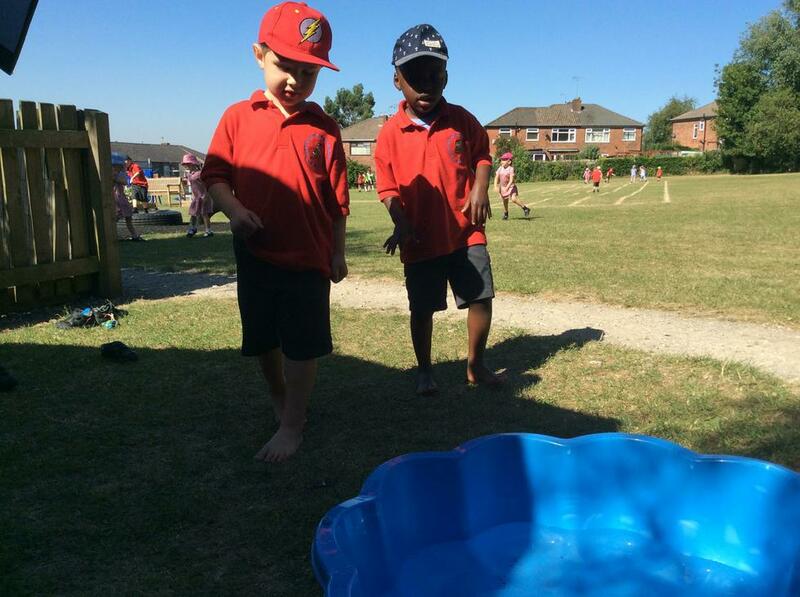 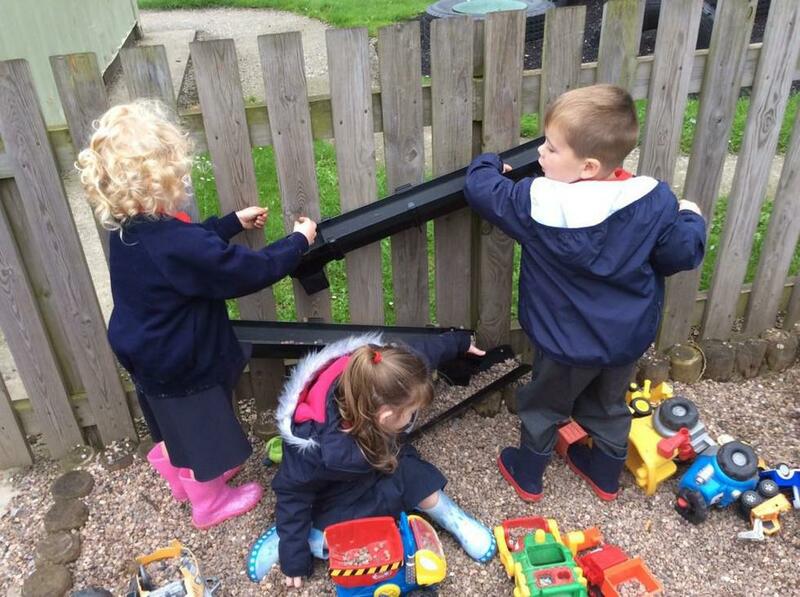 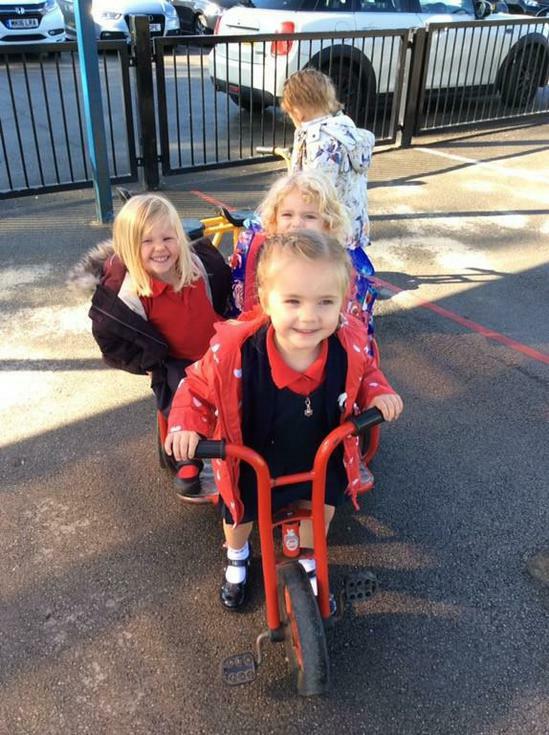 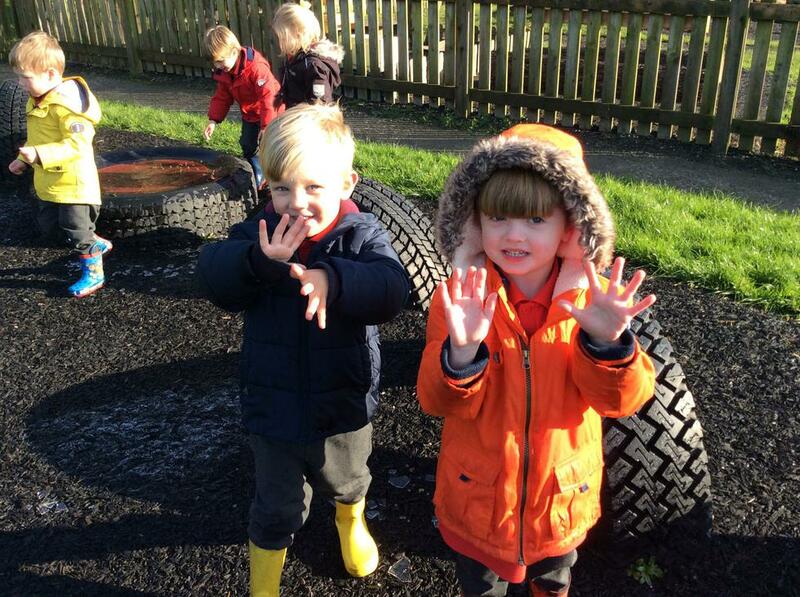 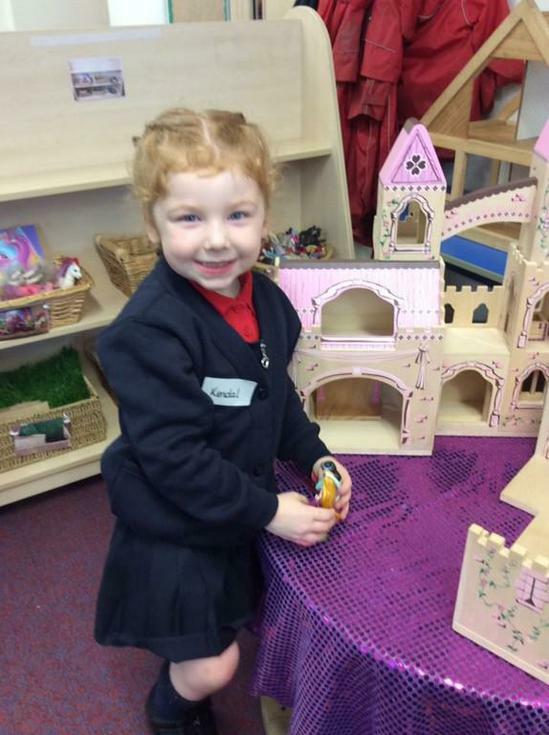 We have had lots of fun exploring our Nursery and making new friends.